It is already a known fact that Nani and Akkineni Nagarjuna have joined hands for a comedy caper. Director Sriram Aditya is directing the venture. Yesterday, Nani took to Twitter to share that he is extremely excited to get to the shooting location. He also said that he is pumped up like a kid and he feels like he is facing the camera for the first time. The reason behind his excitement is that actor Nagarjuna joined Nani on the sets yesterday. 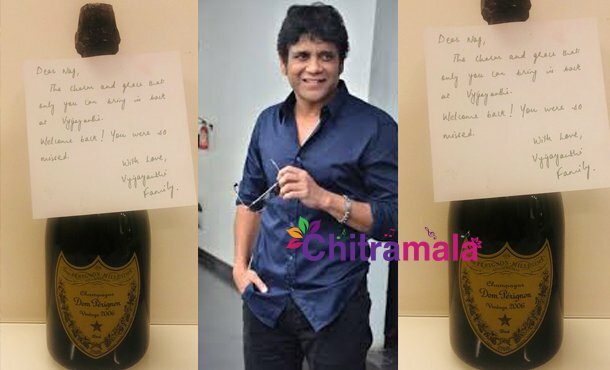 Vyjayanthi Movies, the production house bankrolling this venture, surprised Nagarjuna in style by presenting a gift. But Nag has already made other plans with their gift. The film also has Rashmika Mandanna and Sampoornesh Babu in supporting roles.